After the sock turkey we made with the kids was a big hit we decided to try a bunny for Spring or Easter. Again, this was a big hit with the children. We did it with children ages 3-12 and they loved it. This sock bunny is a variation of one I found on Pinterest. I just made it a little easier with no sewing, which makes it a good craft to do with children off all ages. 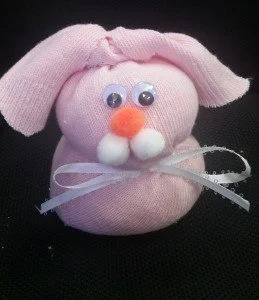 Follow the Step-By-Step directions below to make your very own sock bunny. Step 1: Pour a little less than one cup of rick into the sock. I gave each child a plastic cup of rice to fill the sock. Then secure it with a rubber band. This will be the body of the bunny. Step 2: Pour about half the amount of rick used for the body into the sock, this will be the head. Secure it with a rubber band. Step 3: Hold up the top of the sock and cut down the middle all the way to the second rubber band. These will make the bunny’s ears. Step 5: Glue one cotton ball on the back to make the bunny’s tail.